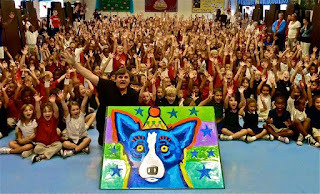 George Rodrigue and I spent much of the past eighteen months on the road visiting museums and communities for exhibitions, lectures, and education events coordinated by the George Rodrigue Foundation of the Arts (GRFA) and the New Orleans Museum of Art, which organized the tour as part of its 100th birthday celebration. 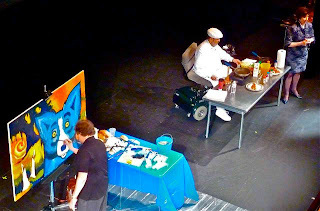 Locations included Baton Rouge (pictured above, during a painting and cooking demo with Chef Paul Prudhomme), Lake Charles, Slidell, Shreveport, Alexandria, Monroe, Auburn University, Little Rock, and the Florida Panhandle. (click any of these cities for the story and photos from that event). The tour made for a rewarding year, as we raised money and awareness for arts education, the focus of George’s foundation. 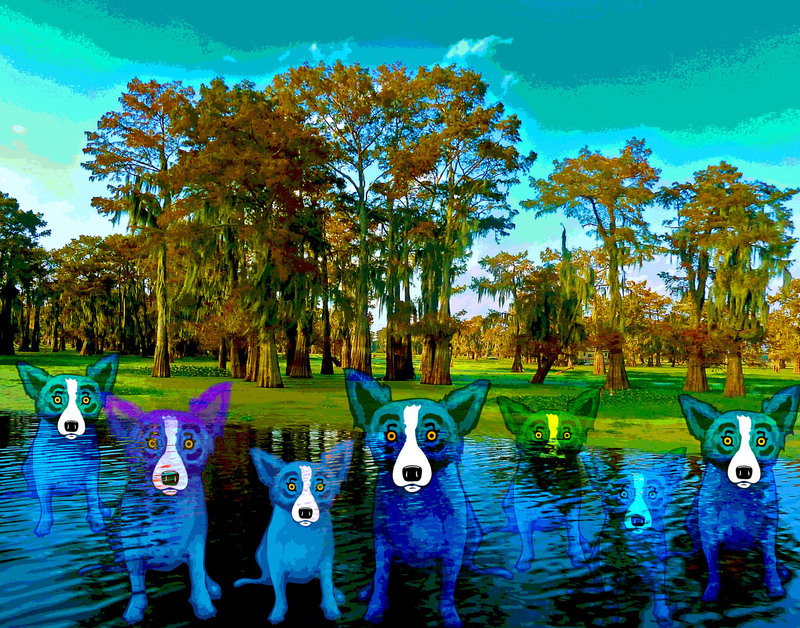 In Louisiana, these efforts strengthened the success of GRFA’s annual art contest, now in its third year. 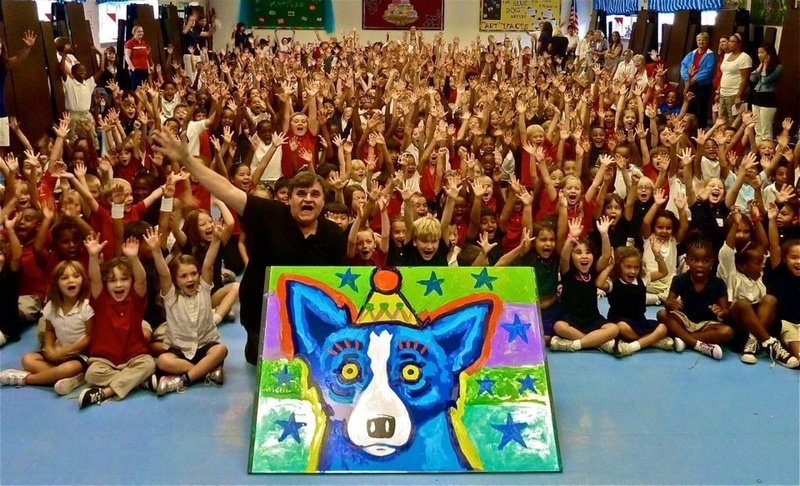 In addition to scholarship money, this year’s first place winner, announced next month, works with George Rodrigue on the Official Bicentennial Poster, celebrating the two hundredth birthday of Louisiana’s statehood. 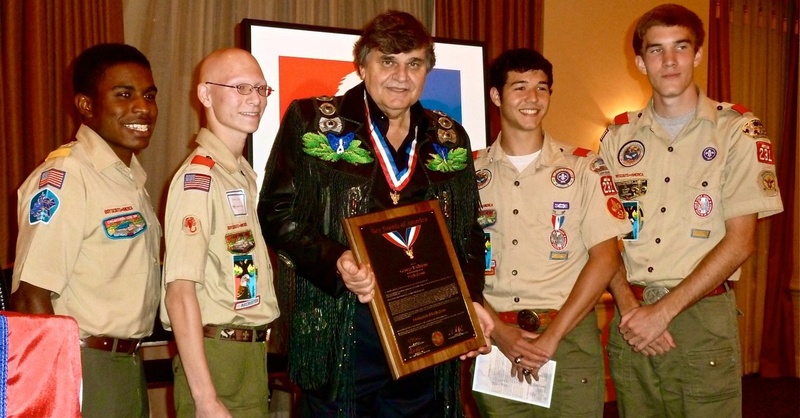 Last summer we opened the GRFA Education Center on Magazine Street in New Orleans and participated in our first White Linen Night (story here), followed by Dirty Linen Night the following week in the French Quarter, events we’ve missed in the past while in California. 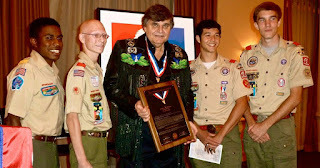 In addition, George Rodrigue received in 2011 the Distinguished Eagle Award from the National Boy Scouts of America (story here) and the James William Rivers Prize from the Center for Louisiana Studies at the University of Louisiana at Lafayette. 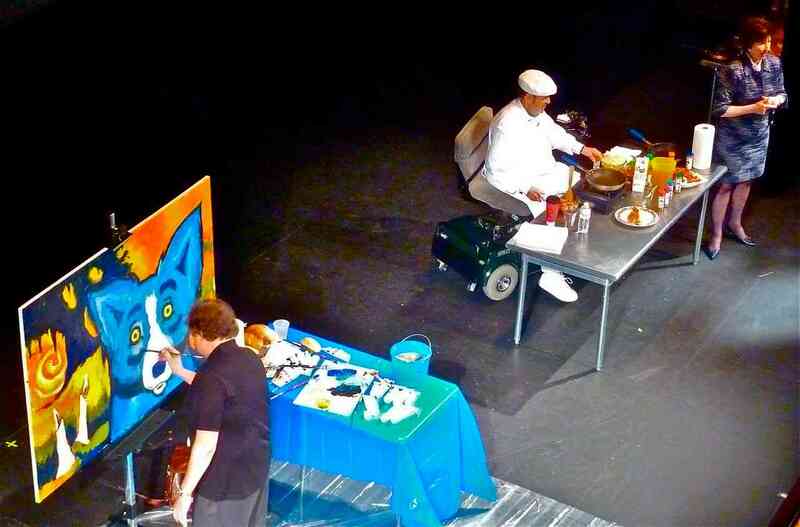 His Number One Tiger Fan raised hundreds of thousands of dollars for the LSU Museum of Art, the Tiger Athletic Foundation, and the George Rodrigue Foundation of the Arts. For George Rodrigue, these programs and exhibitions left him with little time to paint. We spent just a brief few weeks at his Carmel studio, so that in one year he created only a handful of paintings, most in New Orleans in between openings. He also painted during more than a dozen public demonstrations, when he worked quickly and with large brushes before an audience, such as the examples pictured at the top of this post. 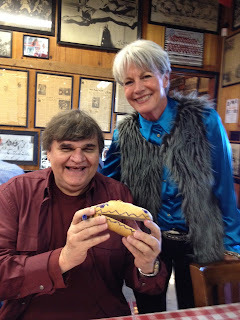 I spent 2011 recording our travels and sharing in depth studies of George’s art (see the categories to the right of this post). I also marked one year of writing for the New Orleans newspaper Gambit Weekly and began a new blogging project for Country Roads Magazine, as well as contributing essays on numerous Louisiana artists to the book The Bicentennial History of Art in Louisiana (published April 2012) and KnowLA: The Digital Encyclopedia of Louisiana History and Culture, projects sponsored by the Louisiana Endowment for the Humanities. 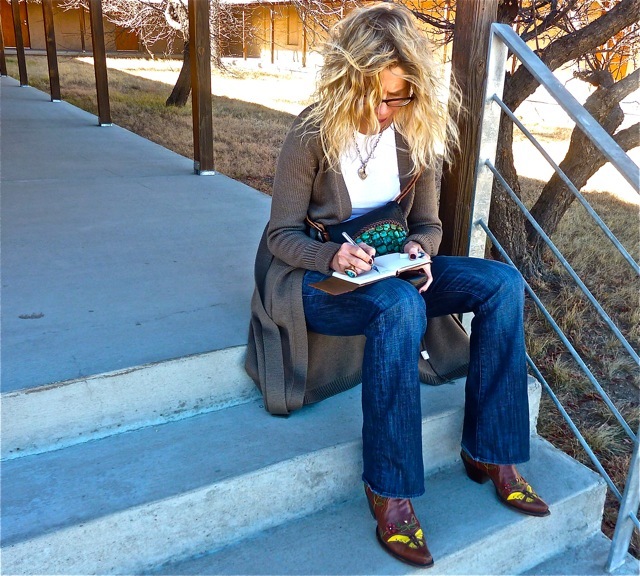 Although I enjoyed writing, the news was not always welcome. If we lump the artist-losses together, 2011 could be like the day the music died, but for art. In August I wrote for Gambit about my favorite, Lucian Freud (1922-2011), whose 2005 Venice exhibition entranced me for days, as I wandered alone or dragging George, my obsession and questions trying his patience. 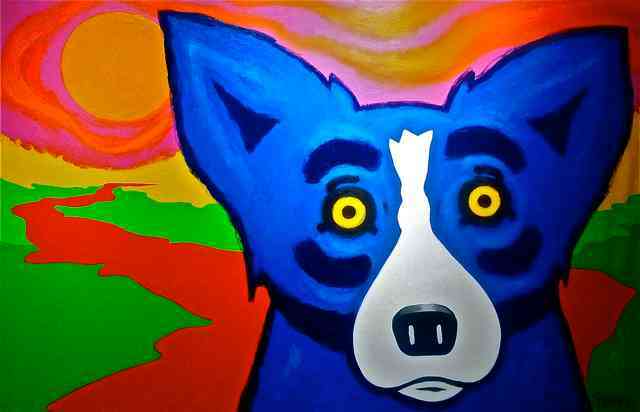 Page’s thoughts transition nicely into the New Year – not only for her – but also for George Rodrigue, who plans five months at his easel, creating with a time and mental dedication unavailable to him since series such as Bodies and Hurricanes. In other words, expect surprises in 2012. 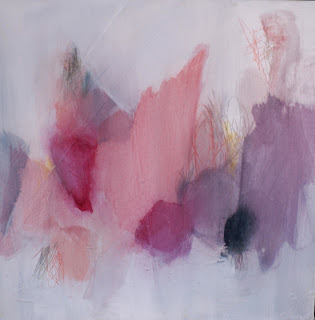 His plans also include paintings for upcoming exhibitions at the Amarillo Museum of Art (opening August 2012) and the National Steinbeck Center (opening Fall 2013). Most thrilling, we’ll hit the road in our truck, resuming our annual cross-country drives,* this time incorporating three weeks in April exploring the state of Texas. I look forward to sharing our adventures and George’s paintings with you throughout the year at Musings of an Artist’s Wife, Gambit Weekly, Country Roads Magazine, Facebook and Twitter. Many thanks, as always, for reading. Happy New Year to all! I'm glad to hear that George will be giving up all that frivolity to get some damned work done for a change! I hope he has fun and that you do too, Wendy. Best wishes to you both (and the Blue Dog) for a great year ahead. Sorry for this odd method of contact, but I couldn't find an email. My name is Meredith Wilson. I'm a Louisiana native currently living in Vienna, Austria. My husband is with the International Atomic Energy Agency and I do a lot of volunteer work with the American community here as part of the United Nations. This year, we're hosting a "Wish I Was In Louisiana" Mardi Gras party. Obviously, finding Louisiana theme items is not terribly easy here. If there's anyway I could order advertising posters/ banners promotional items for decoration such as used to promote shows/galleries/events I would appreciate it. Please let me know if this is possible. I would really appreciate it. Words cant express how homesick we get here, and these small things mean a lot. Hi Meredith - We received your email as well. I'm not sure that we actually have anything to send you, but I did ask my assistant Bertha Bernard to send you some options for ordering beads. Years ago, George and I hosted a huge Mardi Gras party at the Amerika Haus in Frankfurt, and the bead distribution places in LA were great about sending. Good luck! 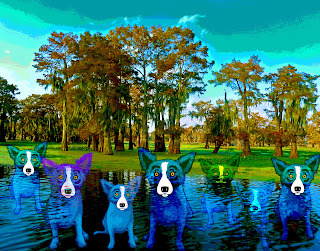 thank you for the reply, we've managed to get cases of beads, coins, masks etc As a long time fan of both the Blue Dog, as well as the Cajun painting, I was just hoping to show our guests a bigger idea of Louisiana. I believe I read that you studied in Vienna so you know what a lovely city it is to be in, which doesn't stop you from missing home every now and again.